Here I am watching Super Why and it would appear that the Super Readers have gone into a comic book invented, apparently, for the purposes of the show called “Attack of the Eraser”. This is an improvement over the usual course for this series, which is to go into a real story and completely butcher its original intent. Maybe they’ve realized that using fictional source material means they don’t have to ruin classic literature? Yes, I’m writing about Super Why again. I’m twenty-eight years old, why do you ask? I can still complain about the main character, though. When Whyatt realized they were facing a “Super Big Problem” (his words, it was actually some minor thing that only the Super Readers would even mildly care about) he did what he always does, he uses his little PDA thing to summon his friends, the other members of the Super Readers. But this time They Were Standing Right Behind Him. All of them! Right There! I hate you Whyatt!!! I do, however, love how the cover of the Attack of the Eraser has this blurb that says “Comic Book!” and I think all comics would benefit from utilizing this blurb. Permalinked: Super Why vs. Comics. 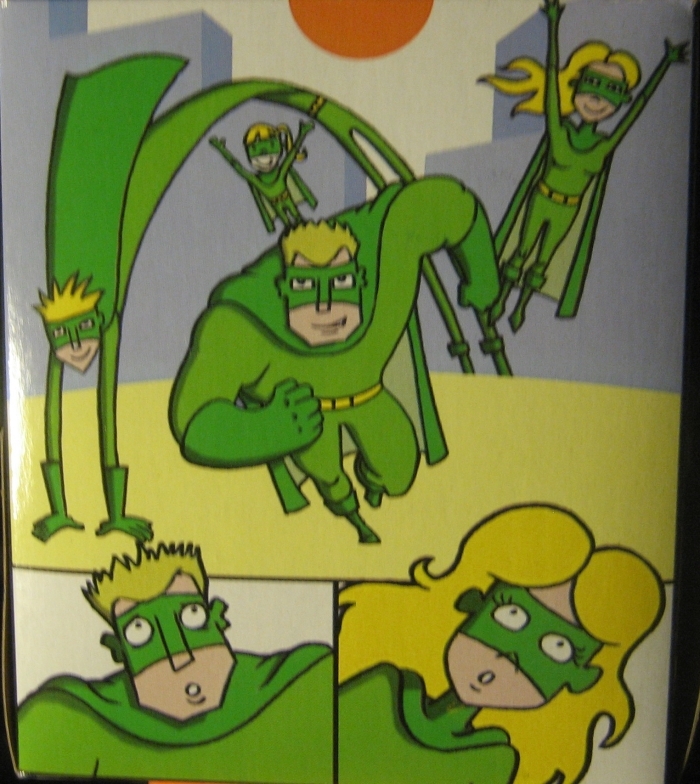 A year or two ago I bought a box of tissues solely because it had superheroes on the box. At the time I didn’t need them, I just liked that it had superheroes so I bought it. 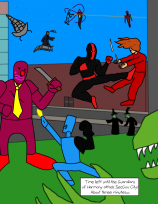 Hopefully revealing that weakness won’t lead to manufacturers of products like corkscrews and ladles adding heroes in the hopes of getting my sales. But anyway, I mostly forgot about them until this holiday season when I got something of a cold. Now needing the tissues and keeping the box by my side for several days I got to thinking about them once more, and now I must bring that thinking to the Internet. There they are. They are out on patrol perhaps, notice a big monster and proceed to stop its rampage. That’s superheroes for you. I’ve no doubt that these guys are inspired by the Invincibles. They’re definitely a family. First thought, I would say they are Environmentally friendly heroes. The green costumes. 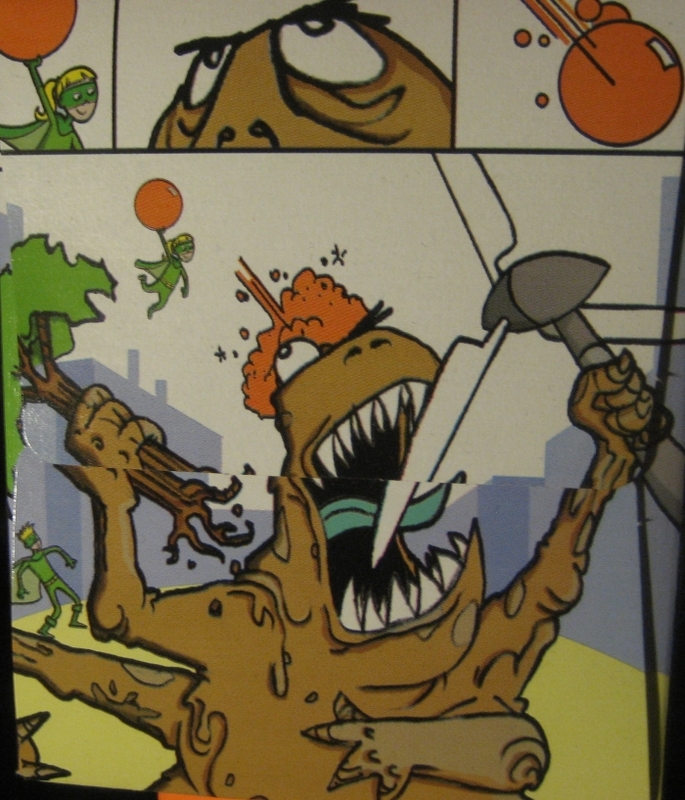 The slimy monster who eats trees and windmills (!!). The fact the tissue paper they sell was made of recycled materials. It all adds up. 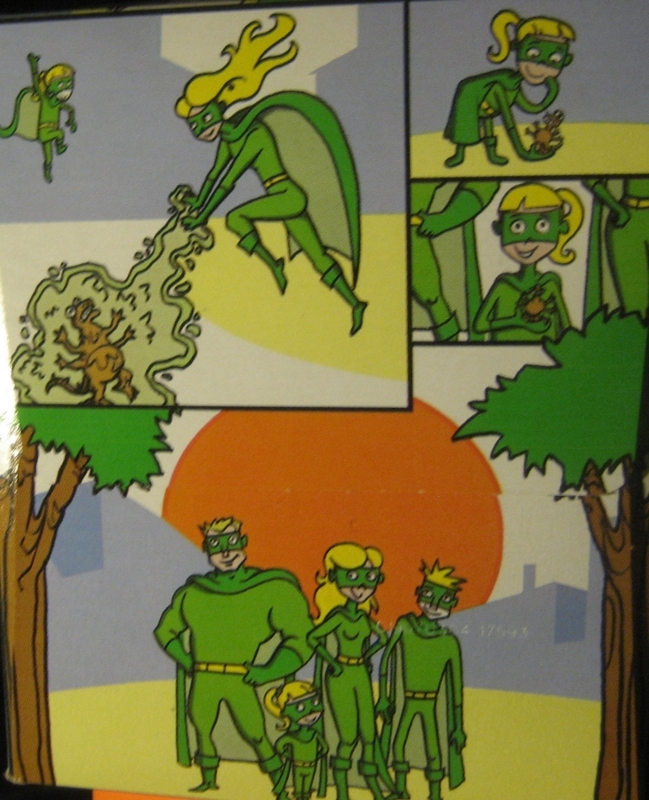 Perhaps they’re not like the Planeteers who only fight enviro-crime, but they certainly lean that way. The little girl can fly and create some manner of, what appears to soap, which she throws at the monster. Perhaps she can create other things to throw and was just choosing something appropriate to the situation? The fact she keeps the pollution monster as a pet shows that she’s an idealist. Even that evil beast, she feels, could be redeemed with a little love. The boy, probably a young teenager has elastic powers. The way he raises an eyebrow before grappling the creature’s leg tells me that he is something of a jokester. But he is no loner. You can tell he likes being part of this family. Probably because they are superheroes and that’s awesome. Mom can fly and shoot some sort of energy from her hands. Either it’s a cleansing beam in accordance with the posited environmental theme, and this is why the pollution monsters shrinks, or it is just a straight-up shrink beam. Either way, that’s our finishing move for this skirmish. Now, the father is interesting. I have no doubt that his frame holds superhuman strength and probably nigh invulnerability. But what impresses me most is that he stays out of the fight. A coward? No, I suspect he knows that punching that thing’s face off is just going to make a mess and his family is more than capable without him. These guys have clearly done this before. So that’s them. We don’t know their names or anything else about them. 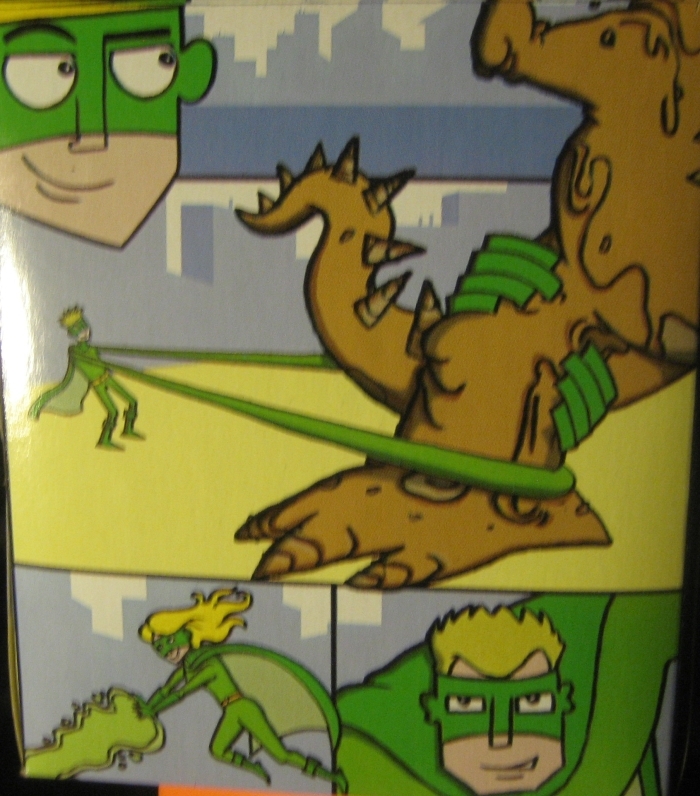 I have to wonder, though, did the person hired by No Name brand to create these heroes and decorate a box of tissues with them put more thought into them than went into the story. Is this a case of fictional characters who have been thought out more than their medium gives them a chance to show? Could their creator have given them names and origins or were they but a moment’s work and then forgotten. Were they a labor of love or a mercenary way to spend a day drawing? Either way, this post is a monument to these forgotten heroes. We salute you! You’re still better than Aquaman. I AM PROBABLY THE FIRST PERSON TO TALK ABOUT THESE GUYS ON THE INTERNET. I WIN. My cold is totally better now. Permalinked: So who ARE these guys? Big Brother Saw You Naked. So there’s those new high-tech scanners that make a 3-D image of your naked body, right? I guess they’re coming to the local airport right now so I’m seeing discussion in the papers of whether such an invasion to personal privacy is worth it for that security. It sometimes seems like I am supposed to hold the opposite view considering all my other beliefs, but I really don’t consider those scanners all that bad. Sometimes I think that people are a little too reactionary when it comes to “Orwellian” stuff like this. In 1984 the fact that Big Brother Is Watching seemed much less evil to me than the fact that Big Brother was lying to the populace and suppressing thought and actively manipulating minds and torturing and all that. Now I’m not saying that the government should be tapping everyone’s phones and have flying cameras peering into their windows, but being scanned before you get on a plane does seem perfectly reasonable to me. I guess people consider this one of those situations where we’re on the slope and in danger of falling further, but it just doesn’t seem like a big deal to me. The only compelling argument against it I’ve seen is the people who say it wouldn’t really make things that much safer. But even then as someone who has been patted down and had his bags searched and all that, I’ll take the scans just for the expediency it seems to offer against our current system that also doesn’t work. Of course, as always, my preferred method of making air travel safer would be to try to make a world where people don’t see blowing other people up as preferable to the lives they have to live. But that might be a bit more work. Permalinked: Big Brother Saw You Naked. Usually Patrick D Ryall does not make New Year’s Resolutions. This year, he is going to go against that trend. This year: Patrick D Ryall is making a New Year’s Resolution! Alert the newsmedia! Do it quick! This year, Patrick D Ryall is not going to buy ANY nails! None! At all!!! THIS YEAR, I WILL NOT BUY ANY NAILS! You may be in shock. Probably you are. Just take a deep breath and sit down for a while. Remain calm.